How do Playoffs teams get determined? How does playoff seeding get determined? The number of teams that make the playoffs is determined by the Playoff Teams setting. This can be modified anytime up until the playoffs begin. 4 team playoffs last 2 weeks. 6 and 8 team playoffs last 3 weeks. For 6 team playoffs, there is a bye week in the first week of the playoffs for the top 2 teams. Keep in mind that we also offer custom seeding options. Playoff seeding works differently for leagues with and without divisions. Overall Record takes precedence over points for (PF), which takes precedence over (PA). Tiebreakers beyond that is a coin toss, or can be determined by another metric the commissioner sees fit via custom seeding. In leagues with divisions, the winners of each division automatically make the playoffs. In 6 team playoff leagues, the bye week goes to the 2 division winners with the best record, based on Overall Record > Points For > Points Against. Any remaining playoff slots are filled by teams that did not win the division, and seeding is sorted by Overall Record > Points For > Points Against. In a 4 division league, the top 4 seeds will always be given to division winners, while the remaining bottom seeds will be filled with non-division winners. 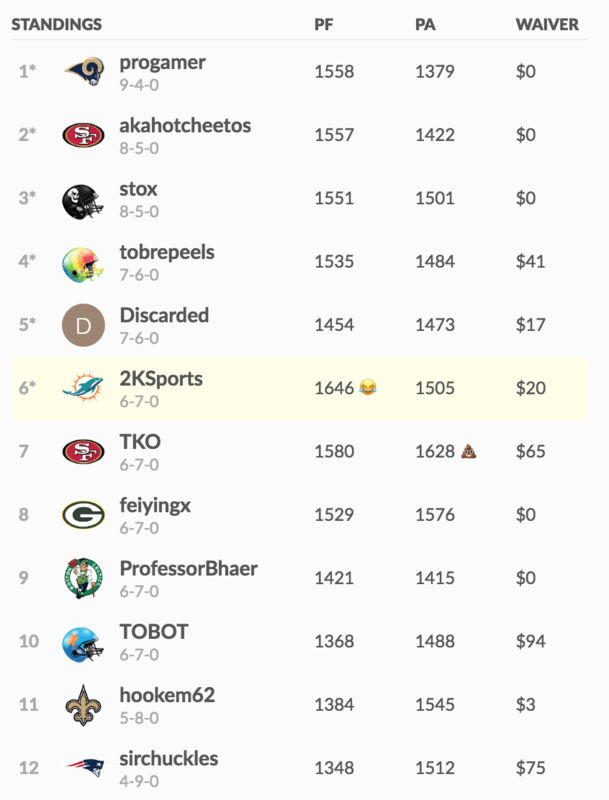 This can be customized by modifying the standings manually via custom seeding the week leading up the playoffs if you play by different rules.